While I was travelling to Texas in January, I accumulated a day in lieu...and seeing I have trouble using all my holidays in a year and Cameron has to have a tooth extracted this afternoon I decided today would be a good "lieu day". Some housework and stitching this morning, maybe some cupcakes and supper for my three boys this afternoon. Here is where my ICM (Ink Circle Mandala) Spring is as of this morning. Spring is really coming along. You're fast! Aren't the colours wonderful? 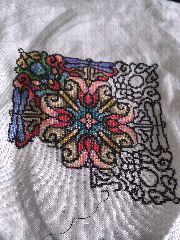 I'm about 2/3 done the first quadrant, and loving the colours. Very pretty Rebecca! It's coming along nicely. Hope Cameron's extraction went well.